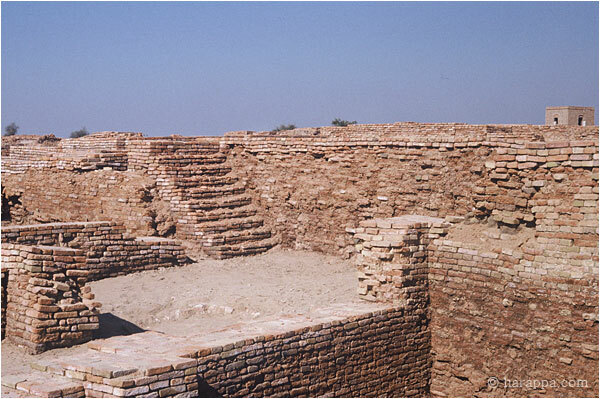 In addition to hundreds of wells, Mohenjo-daro would have had hundreds of staircases. 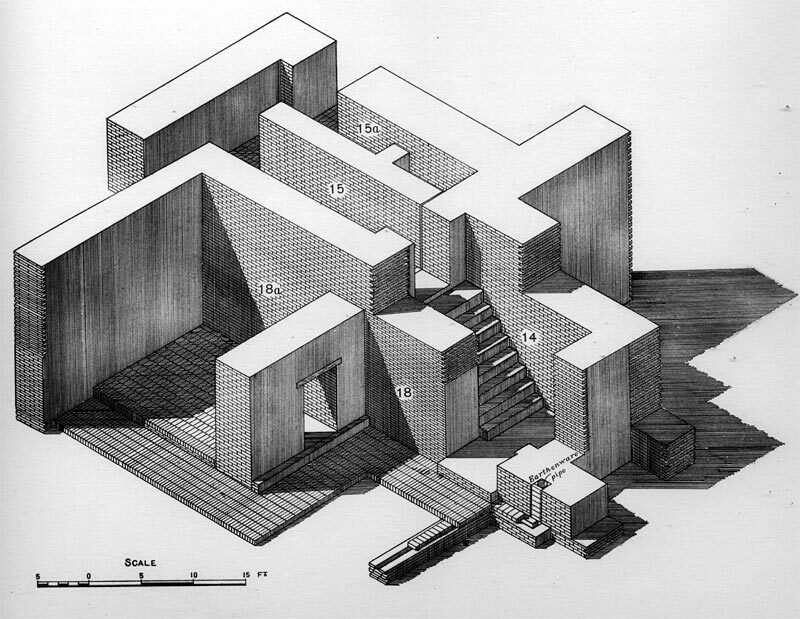 As in Image 1 for example, many houses had stairs leading to upper courtyards of the building or to a second floor. This house in HR area had a double staircase that would allow people to enter and exit the upper courtyard in an orderly fashion. Some scholars feel this may have been a palace or a temple. Image 2. House A1 may have been a temple or palace of an important leader. Two doorways lead to a narrow courtyard at a lower level. A double staircase leads to an upper courtyard surrounded by several rooms. This house had numerous seals and fragments of a stone sculpture depicting a seated man wearing a cloak over the left shoulder. Image 3. 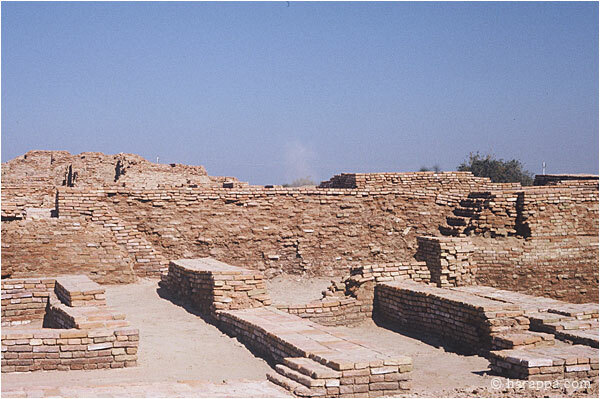 House 8, was an "average upper class house" in the HR section of Mohenjo-daro. John Marshall wrote "The living and sleeping rooms of the family were all on the upper floor, which was reached from the courtyard by way of the staircase 14 [Figure 3]. One of them, (No. 16) and the passage-ways 15 and 15a, are raised up on a solid basement, in order to provide against the menace of floods, the idea being to have at least one fair-sized room where the family cound find refuge if the rest of the house collapsed." (John Marshall, Mohenjo-daro and the Indus Civilization, pp. 19). Image 4. This well located in DK-B area was originally surrounded by a paving that has recently been reconstructed and was reached by stairs. 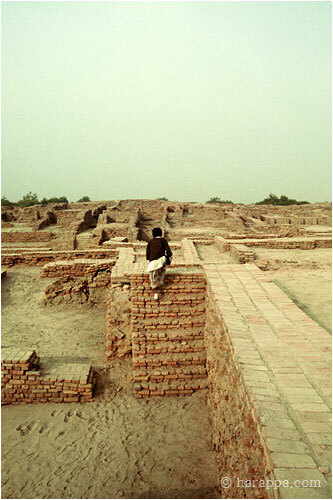 See more at Stairways of Mohenjo-daro I.